The Archive Series compiles out-of-print, compilation and previously-unreleased material. Undecisive God/Clinton Green “Archives 1-10: 1991-2007” 19 CDR set (Shame File Music) – The complete set of the ten instalments of the Archive series issued thus far. 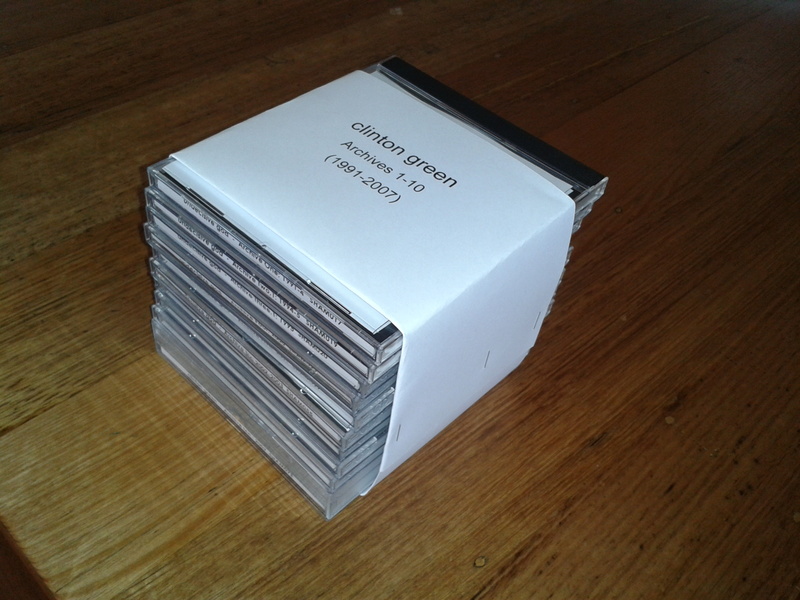 19 CDRs covering 16 years of rarities, out-of-print releases, compilation tracks, alternate takes/mixes, live recordings and previously unreleased tracks by Green’s Undecisive god project. The CD cases come bound in a handsome card scroll. 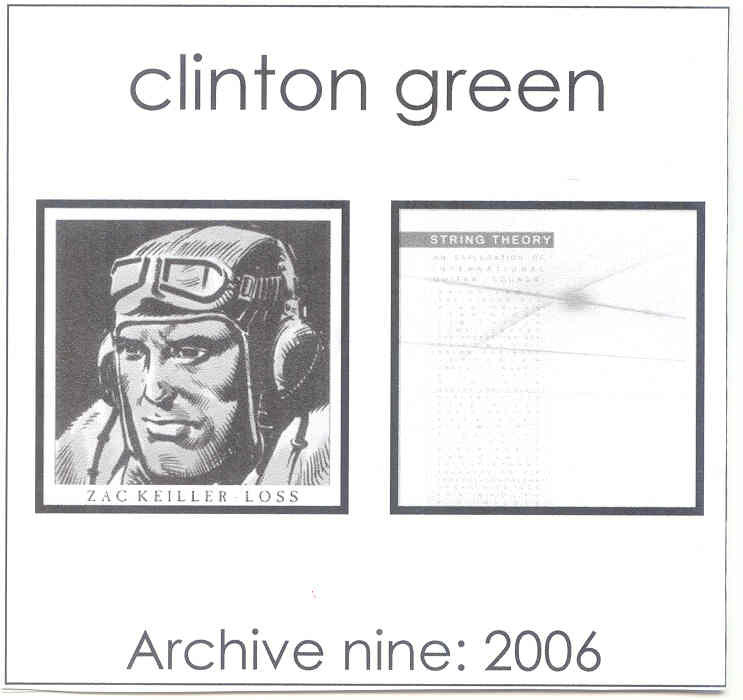 Clinton Green “Archive ten: 2007” 3CDR (Shame File Music, 2013) This edition of the Archive series includes Green’s very first prepared turntable recordings, including the out-of-print “Duos for Guitar and Broken Records” EP, along with previously unreleased tracks. Also documented are latter-era guitar experiments, including all tracks from the collaborative album with Zac Keiller “Residential”, a live performance and several more unreleased/compilation only tracks. 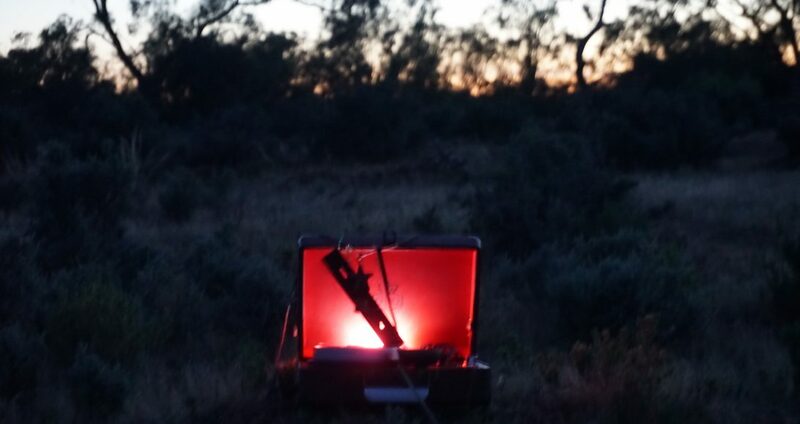 Undecisive God “Archive nine: 2006” double CDR (Shame File Music, 2012) – The first disc features two now-unavailable tracks and a full live performance, all in collaboration with Melbourne ambient guitarist, Zac Keiller. The second disc features solo works for field recordings and guitar, previously unreleased or compilation-only tracks. Also of interest is a short piece commissioned for a law librarians conference! Undecisive God “Archive eight: 2005” double CDR ((Shame File Music, 2011) – Unreleased recordings with guitar and digital delay, plus excerpts from two live performances. 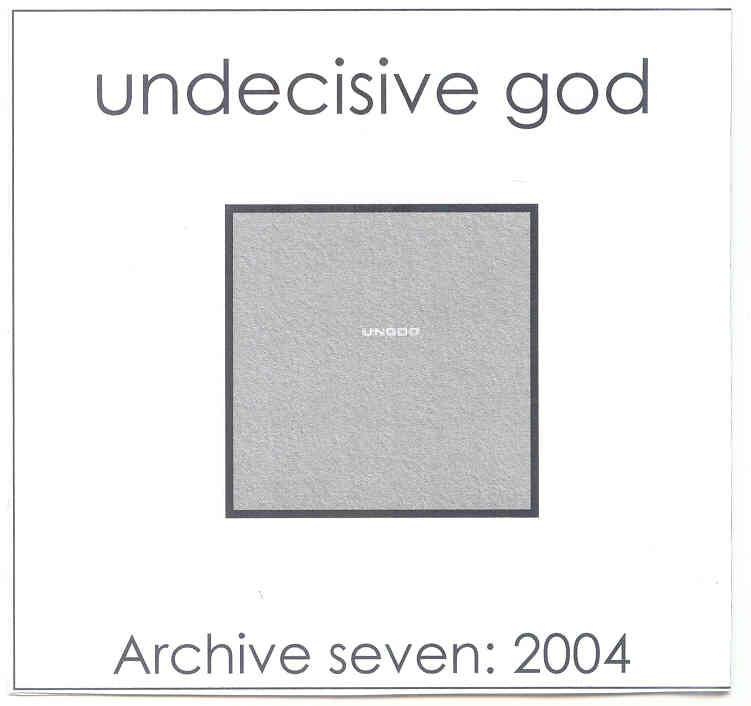 Undecisive God “Archive seven: 2004” double CDR (Shame File Music, 2010) – A complete live performance in Brisbane, reissue of the Live Performances tracks, plus a range of previously-unreleased tracks including collaborations with Jodi Rose and New Waver. 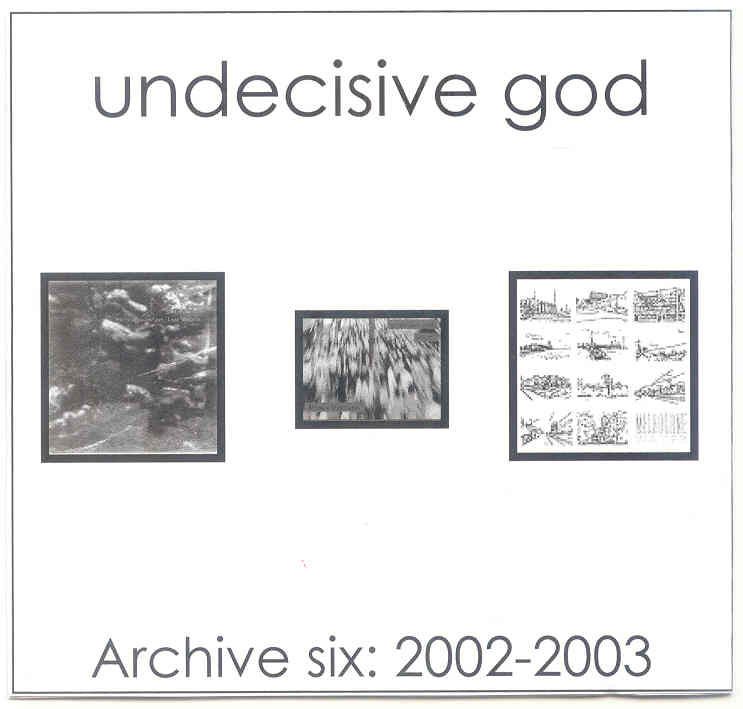 Undecisive God “Archive six: 2002-2003” double CDR (Shame File Music, 2010) – Reissues of the now-deleted “Modern Discourse” collaboration with WIT, several compilation and unreleased tracks, and a complete live performance. 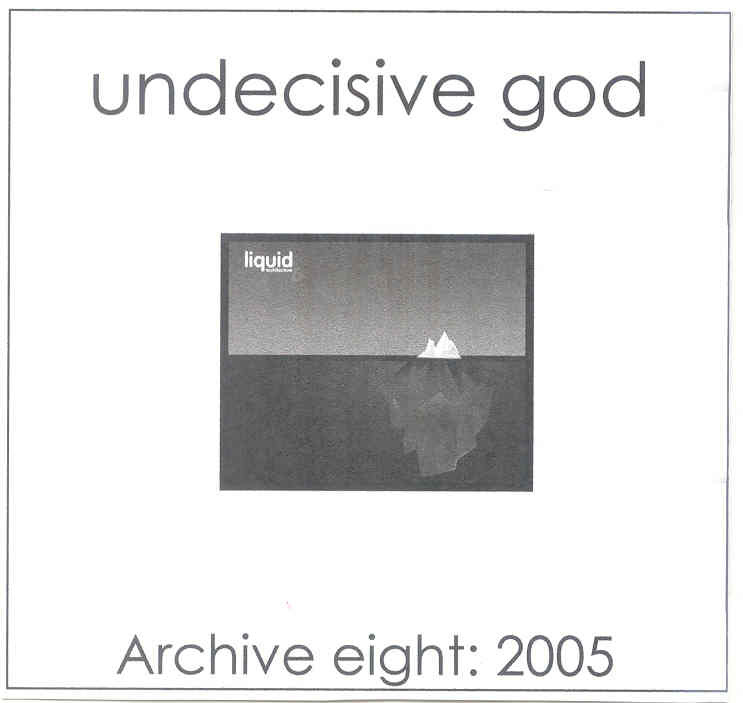 Undecisive God “Sound Archive” CD-ROM/mp3 CDR (Shame File Music, 2005) Contains volumes 1-5 of the “Archive” series and all Undecisive God releases up to “Border Protection Policy” in mp3 format with full liner notes in a web-based interface, also playable on mp3-compatible hi-fi units. 99 tracks – the complete recorded output from 1991-2003. 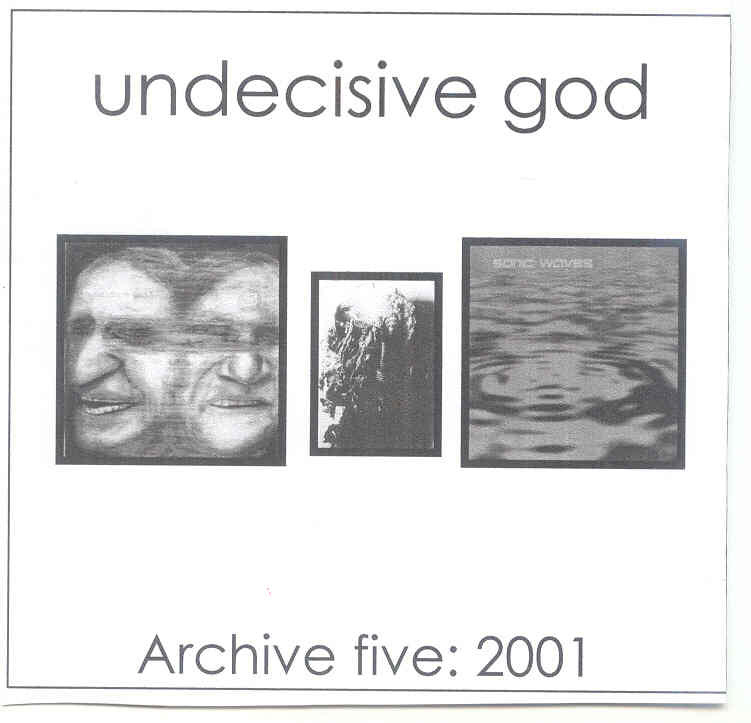 Undecisive God “Archive Five: 2001” double CDR (Shame File Music, 2004) This archive features tracks from the now unavailable split CD with AGIT8, a complete live performance, as well as compilation-only and previously unreleased tracks. 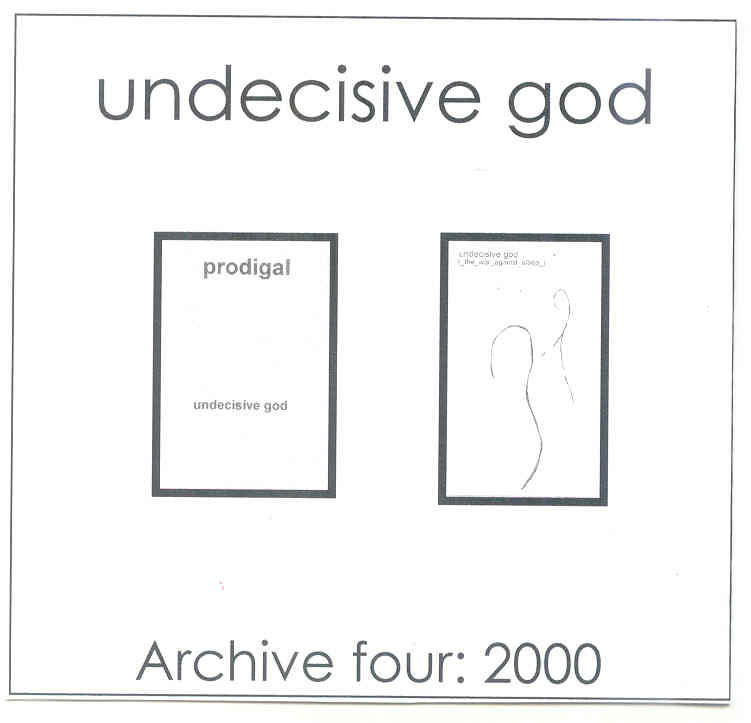 Undecisive God “Archive Four: 2000” double CDR (Shame File Music, 2003) Features remasters of cassette, compilation and unreleased tracks from 2000, including the “Prodigal” and “(_the_war_against_sleep_)” cassettes. 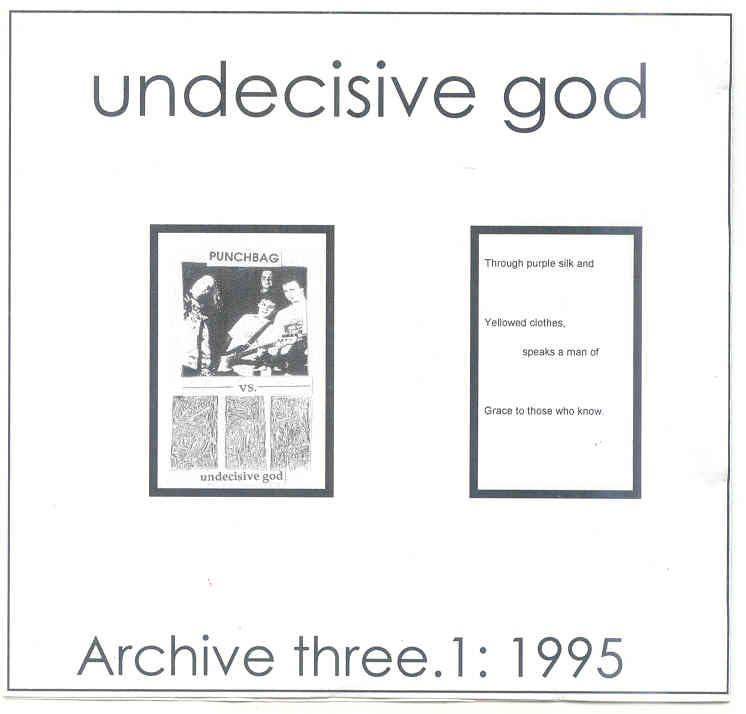 Undecisive God “Archive Three.1: 1995” double CDR (Shame File Music, 2003) This Archive features the Undecisive God tracks from the split cassette with Punchbag, the entire Purple Silk, Yellowed Clothes cassette, and a previously unreleased track. Updated with a newly-discovered early version of “Sisterly”. 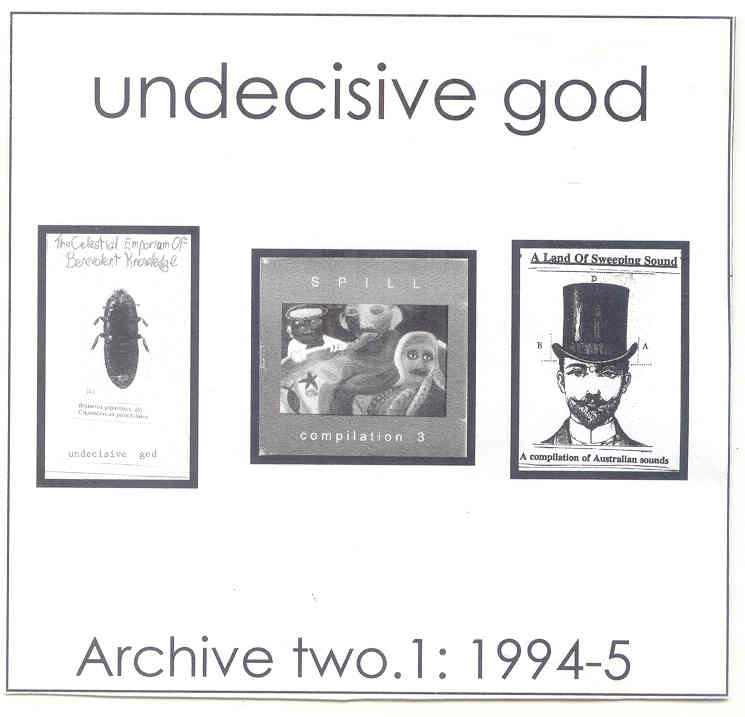 Undecisive God “Archive Two.1: 1994-5” CDR (Shame File Music, 2002) This CD archive features Undecisive God’s second release The Celestial Emporium of Benevolent Knowledge, plus 3 other compilation tracks. Also unearthed is an early version of “Hallowed Be Thy Name”, which I’ve added to this Archive, thus making it version Two.1. 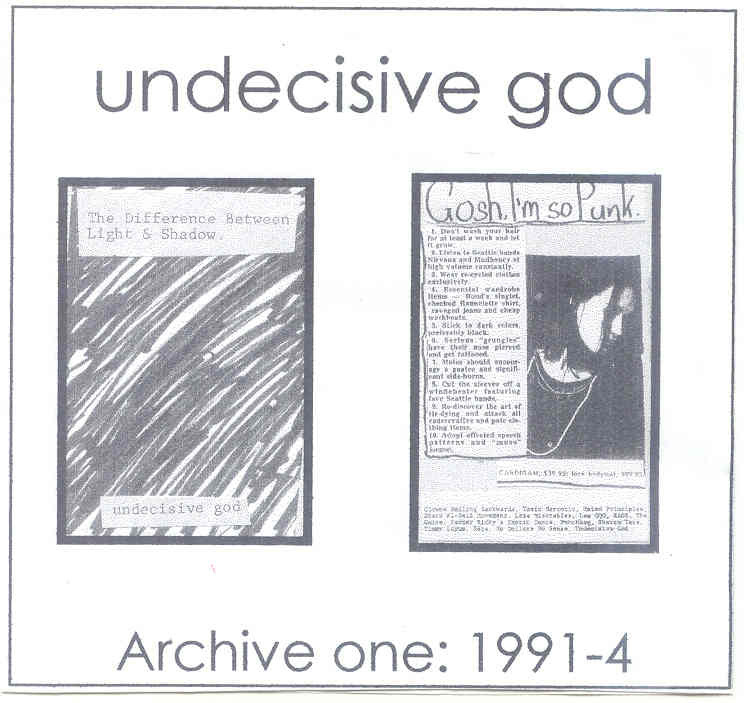 Undecisive God “Archive One: 1991-4” CDR ((Shame File Music,/Smell the Stench, 2002) The first in a series of CDRs collecting Undecisive God’s history of recordings. This includes the debut cassette The Difference Between Light and Shadow in its entirety, plus some previously unreleased material and compilation tracks. 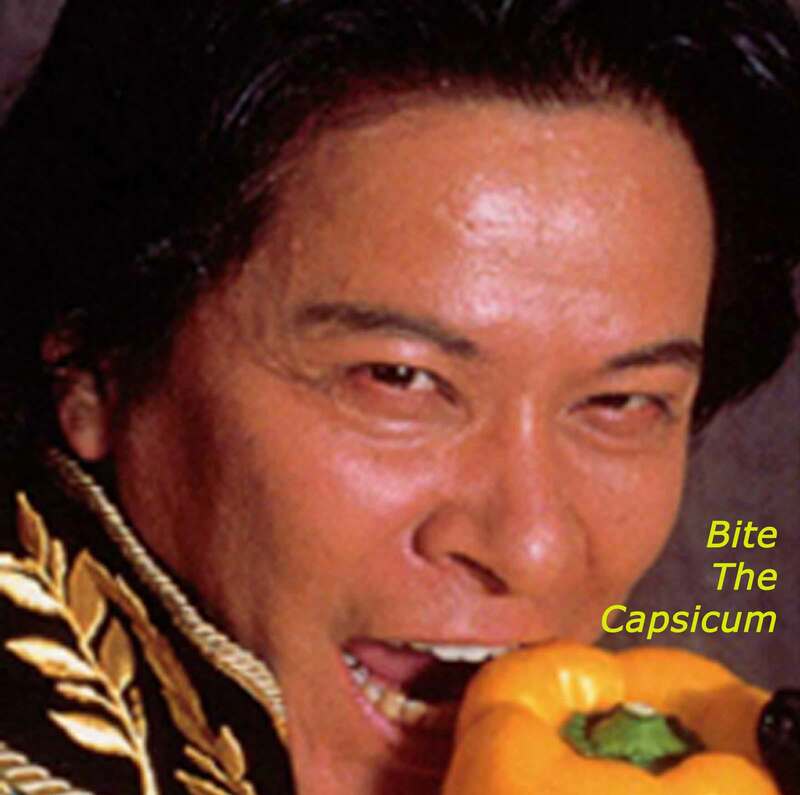 Moe Chee “Be It Hot, Humid or Ghostly Cold” CD/download (Shame File Music, 2018) – Recorded in the streets and various locations around Taipei in 2015 (except for the last track, recorded on a Walkman distributed to the audience during a 2016 participatory Moe Chee performance in Melbourne), Be It Hot, Humid or Ghostly Cold is an amalgam of field recording, public space performance, conversation, and explorations of the potential for creativity and musicality in everyday life. 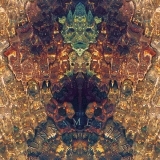 Limited edition of 50 CDs in covers designed and handmade by Tasmanian artist, Anna Dusk, as well as digital download. Moe Chee and Jen Callaway “Testament of the Trinity” cassette (Alberts Basement, 2017) – This recording documents the sixth day of Moe Chee’s seven day public space performance piece End of April, Beginning of May (2015). Recorded in front of the State Library Victoria, Testament of the Trinity takes place around midnight on a Friday night in Melbourne, incorporating a streetscape of late-night revellers & Christian preachers. Moe Chee weave and interact through it all, with guest performer Jen Callaway (of Is There A Hotline?, Hi-God People and more). Cassette is produced with two alternative covers. 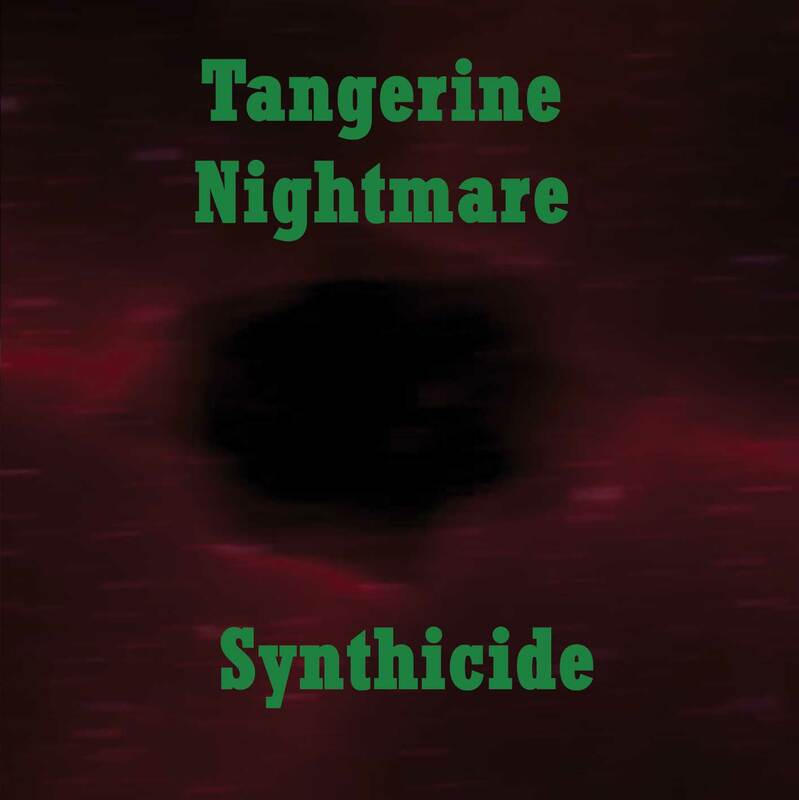 Tangerine Nightmare – “Synthicide” CDR (Shame File Music, 2010) On a winters night in Melbourne, 2009, three long-time practitioners of drone and noise music came together for an evening of exploration of analogue synthiser sound. Lloyd Barrett, Clinton Green & Andrew McIntosh (Screwtape) used a variety of analogue synthiser units and plug-ins to form several long improvisations that ranged from deep drones to roaring waves of oscillator noise. 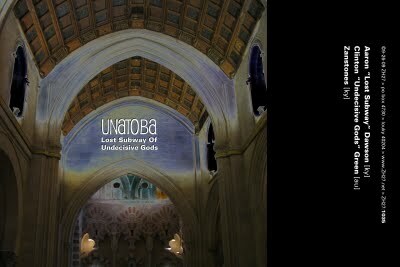 Unatoba “Lost Subway of Undecisive God” cassette (ZH27, 2009) Improvisation with Clinton Green (guitar, voice), Aaron Dawson (guitar) and Zan Hoffman (organ, voice). Limited edition of 27 copies. Bokor – “Loss” CDR (ZAC, 2006) Ambient, atmospheric guitar workouts with some field recordings, featuring Clinton Green on 2 tracks. The Unnameable “But of that, I will not speak…” CDR (Shame File Music, 2002) A collaboration with Andrew McIntosh of N.FIOS/Screwtape, Parasicitus Dei and Scroungers. This is an ambient/noise tribute to seminal horror writer, H.P.Lovecraft.